Went to his new home on Sunday 25th March 2007. 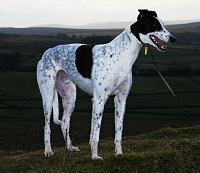 Joe is a white and black greyhound with a 'Dalmatian' look to his coat, which looks stunning. 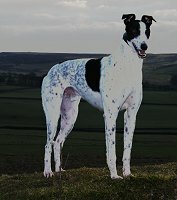 He was born on the 16th May 2004 making him just over 2 years 8 months old. He weighs 74lbs (33.6k), is neutered, inoculated, microchipped, house trained, travels well in the car, walks nicely on the lead, gets on well with other dogs but is not suitable for a home with cats. 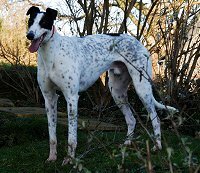 Joe went from kennels last September to live in a home with a family and two children but due to a change in circumstances he has come back into 'Rescue' and is now looking for his forever home. Collected Joe from his previous home this afternoon and introduced him to our dogs outside the car. There was a small grumble from Bobby, which we expected then Joe jumped in the car to be followed by the others. He was a little nervous on the way home because there wasn't a lot of room in the car but once home we took him for a walk, which he enjoyed. Home again he had a good wander around, stairs were no problem then we fed him but he wouldn't eat much. During our tea he lay on the kitchen floor with the others then afterwards he came into the living room so we could watch television. He was a bit nervous at first, not sure where to lay so came over for a cuddle. I had my arms round his neck giving him a cuddle and watching television at the same time when I realised that whilst he was enjoying the cuddle he was also eating my chocolate on the table by my side at the same time - the little monkey. He backed away with a sparkle in his eye when he realised he'd been caught then wanted to come back for more. I went to get some more chocolate - and the water spray! A couple of squirts with the word 'back' a few times and he went and lay down. Probably felt a bit disgusted at not being allowed anymore of that super titbit! The rest of the evening he lay behind the settee in the living room with all the others in their respective places and was as good as gold. Joe slept on one of the beds on the landing last night because our room was a bit crowded! Apart from once when he came into our room round about 1am to see if we were still there we never heard from him till the morning. He was a bit picky with his breakfast and after we let him in the garden off the lead for the first time so he could walk around with the others - he was fine. He's been following the others around all day and getting on with them all - even Bobby, who can be a bit grumpy when a new dog goes too close to his bed. Joe enjoyed his walks and ate most of his dinner this evening. After his last walk it was bath time for Lennie so I thought that as I was wet anyway I would wash Joe as well. He thoroughly enjoyed his bath and once we'd towel dried him off he shook, did a little dance then came back for another dry and another dance before settling in the living room for the evening, he came in, jumped on the settee and cuddled down next to Stuart who ended up with a damp dog next to him. Joe loved his cuddles and when it came to letting them all out last thing he was prancing around wanting to play. He's certainly a lovely dog and apart from the first few hours of nerves he's settled in really well - I just love his colouring, it's superb and he's such a nice dog that he's quickly making his way into my heart. This afternoon after our walk I spent an hour in the garden tidying up areas I couldn't get done last autumn and Joe enjoyed wandering around in the sunshine with Ruby whilst I was working. 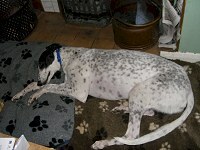 Joe now sleeps in one of the beds in our room at night with the others, is no problem at all and gets on with our dogs. Apart from the first couple of days when he was picky with his food he's now eating better and actively looks forward to it arriving. He's bounded over our bed a couple of times taking a short cut across the room and loves climbing on the bed for a cuddle last thing at night whilst I read my book for half an hour - so now I get two on the bed with me! Last night I ended up with Ruby using my leg as a pillow and Joe using my shoulder. He's a very happy dog who enjoys playing with us, likes to sleep on the settee, enjoys sleeping on his back with legs in the air on the sheepskin rug and yesterday he discovered the toy box! Discovered this evening that Joe loves apple cores! Left a banana and my cup of coffee on the kitchen table whilst I put something in the other room When I came back to pick them up I noticed the banana gone. Found Joe with it on the kitchen floor trying to take the skin off! He'd only managed to open the end so I was able to peel the rest for myself but before doing so I cut the chewed piece off and gave it to him thinking he probably wouldn't want it, but he did - he loved it, so we gave him a couple more pieces. When we threw the skin in the bin he went in after it - looks like we have another fruity dog! A few minutes later he walked past the coffee table and took a drink of coffee and gave me such a cheeky look after he'd done it. This evening was funny because Joe suddenly ran round the living room, jumped on the sheepskin rug then picked it up in his mouth and started playing with it. He ran between the living room and kitchen dragging it behind him before getting fed up and dropping it. I don't thing Joe has seen a horse before because whilst walking along the back road this afternoon two came walking past us. Their horseshoes were making quite a noise on the road and Joe was quite skittish until they were well in front of us. We caught up to them later on as they were being prepared for going in the horse box to go back to their stable so I took the opportunity to have a chat with their owners so he could be in their vicinity. This time because they were standing quietly he was fine so it must have been the shoes on the tarmac as they were trotting down the road that bothered him. During a trip in the car this afternoon Joe spotted some sheep in a field and pranced about in the back of the car whilst watching them. He reacted the same as he did with the horses so we are wondering if he's ever seen sheep before. 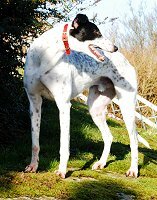 Although he's lived in a house for about five months before coming to us he went there straight from kennels. As his previous home was in the middle of a town we are beginning to wonder how much he visited the countryside whilst there as we would have expected him to know what they were by now. Now knowing this it is an area we can work on with him. During our drive over to Appleby this afternoon to do a home check for someone wanting a greyhound we came across a flock of sheep being moved along the road from one field to another. We parked our car behind the van in front of us and waited till the sheep walked past. Knowing how Joe reacted to the sheep in the field the other day our immediate thought was 'this is going to be fun'. Joe was laying down in the back of the car so never spotted them until they were almost past then jumped up to see what was going on. We were ready for him though and squirted him with cold water and the word 'leave' made him back off and calm down without so much of a bark, which we were very please with. cold but they did what was needed before getting back into the car to come home. The local farmer put his sheep in the field running alongside the back road where we walk most days. As we walked around the corner and saw them I thought good. Now Joe your training begins! I let Indi and Bobby off their leads so they could stroll as normal then got Joe and Ruby under control with my water spray bottle ready. When we approached the gate at the corner of the field Joe saw them and became quite excited. As we walked along the road he was told to 'leave' with a firm voice and sprayed with water every time he showed the slightest interest in them. By the time he was half way along the road he was well and truly soaked and his interest in them waining. He enjoyed his walk around the reserve and then we did the return trip. Not so wet this time because he was quickly learning to look at the sheep mean't he was told to 'leave' and squirted. He spent most of the time walking along the road taking a quick look every now and again but quickly looking in the opposite direction to avoid being squirted. Did our walk along the road again this afternoon. It took a couple of squirts to remind him not to look at the sheep but after that he was very good. It lapsed at one point when a couple of sheep close to the hedge ran into the middle of the field and he became excited but I was ready, a 'leave' and a squirt stopped him in his tracks and we walked along the road again but this time he got a squirt and reprimand every time he had a sneaky look. Stuart had been to a photography exhibition all day and phoned to say he would get a take-away on the way home. However, the Chinese was closed for the week so he came home with nothing. Not to worry says I, we can have some cold roast beef left over from the weekend because it was very tender and tasty. Stuart was at the work surface slicing it when the phone rang so he twisted to reach for the phone and when he turned back the beef had gone. I saw Joe grab the piece of beef and went to get it off him. He was so quick but there was no way he was letting go of it. Stuart forced his finger to the roof of his mouth and we got some out but the piece at the back of his mouth stayed - there was no way he was letting go of that even when sprayed with water. He's been quite good on food front until this evening but we think he got the message we were not happy about loosing our tea because he sulked for the rest of the evening. Joe's training with sheep is going well because the majority of the time he now ignores them. He sometimes takes a look but a 'leave' is often enough to make him look away and continue with his walk. This is something we will continue until he doesn't even look at them - he's getting better by the day. This afternoon a home check was carried out in Essex for a lady who lives with her son and who contacted us wanting to re-homing both Ruby and Joe. 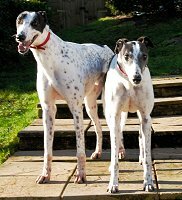 A reference from her vet has been received and because the home check was a pass Ruby and Joe will be going to live together in Essex. However, the lady is looking to buy a bed and breakfast establishment in the Dumfries area so it looks as if their home in Essex will bring them both up north again sometime in the future. Some horses had walked along the back road earlier today because there was manure on the road and before I knew what he was doing he grabbed some to eat. Oh dear! I got him close to me and with water bottle in hand we took a slow walk close to every bit of manure I could see. I wanted to encourage him to sniff and grab some so when he did he got a squirt of water and a firm 'leave'. We kept doing it until he realised it was much better to ignore the piles of manure and before I knew it he was pulling on the lead to get as far away from it as he could. Joe was still interested in the manure again today so we did a repeat of yesterday. He very quickly realised it was best to leave it alone and walked away from it. We will do this every time we see new manure on the road until he learns to walk past and leave alone. Joe loves to run around the garden and play but doesn't quite know what to make of Ruby when she runs up to him trying to get him to play with her. She doesn't do it often but when she does she bounces about in front of him trying her hardest to get him to play with her, which takes him quite by surprise. He probably can't make her out because she's sometimes grumpy with him when he walks all over her on her bed - but then who wouldn't be! 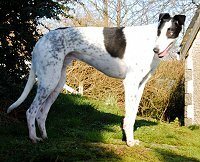 To begin with Joe was fairly quiet then he suddenly came out of his shell and over a period of about a couple of weeks he turned into a bouncy playful dog with a real character. It became quite difficult to get his collar and lead on at walk times because he was so excited at going out, he bounced all over the place, knocking into the others and had to get out the door first. He was quite a handful so training began in earnest to encourage him to wait quietly for his collar being put on and to wait at the door without barging past everyone else. It took him a while to get the message because the thought and excitement of going out was just too much, however, with perseverance, he's now a lot better - not there yet but much better. What a character! Joe likes to say hello to everyone whether out walking, visiting the pub or people coming into the house. He loves people giving him a cuddle, will come up and nuzzle into you for long, lazy cuddles, often comes to me when I'm at my desk and rests his head on my lap so I can stroke him and he adores his ears being stroked and caressed. This evening Joe and Ruby's new owners arrived to collect them and because they came from Essex they are staying over night and taking them home tomorrow morning. Both dogs enjoyed the attention they received and seemed to get along with their new owners. Around 10am this morning we said our farewells to both Ruby and Joe who jumped onto their new beds in the back of their new owner's car and settled down for their long journey home. It was very difficult watching them both leave but we hope to see them again sometime in the future if their new owner's plans of moving to the Dumfries area materialise and we hope the two of them have a long and happy life together. We phoned this evening to see how their journey had been - it was long and Joe was a little impatient at times for each time they stopped he stood up to see where he was. However, they stopped on occassion to let them out to stretch their legs and when we called they were both eating a pig's ear having just explored their new home and surroundings. Received a call this evening letting us know they were both fine. Had a good night last night and enjoyed their walks today so everything seems fine and they are beginning to settle in to their new routine. Received an email from Ruby and Joe's new owner this evening enclosing a couple of photographs and letting us know they are a pleasure to have. Both are as good as gold in the house and when out walking but Joe is still a little wary walking past horses as they come towards him down the road. They've met their new vet who said all was well but they clipped Joe's front dew claws whilst he was there. Received an email this evening letting us know that both Ruby and Joe are in the best of health and enjoying their retirement.